Platinum and white, yellow or rose gold all have a place in the jewelry making world. Find out which metal is right for you. Lauren B of New York uses the finest quality precious metals in order to assure that the appearance and longevity of pieces sold by us last a lifetime. The two major types of metals used in fine gemstone and diamond jewelry are platinum and gold. In the case of jewelry, art is the design patterns and gemstone combinations that form the jewelry we carry. For a full overview on metal color options watch this educational video here. Platinum is an extremely rare metal that is characterized for being very strong and dense, yet supple enough to be reworked into any number of jewelry designs. This valuable metal’s place in jewelry making traces back to ancient Egyptian times, and has experienced a noticeable resurgence in popularity of late, especially when it comes to engagement rings. 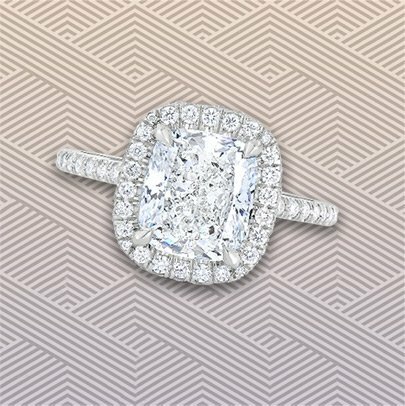 Platinum is naturally white in color, and its natural luster acts as a beautiful setting for the brilliance and sparkle of diamonds. Platinum is a dense, strong metal which gives it a substantial feel/heft, while making it resilient to scratching. Also, because it is white in nature, platinum rings do not have to be rhodium plated to maintain its color. Compared to white gold, platinum jewelry is made at least 80% pure, while gold jewelry can be as low as 58% pure gold- as is found in 14 karat gold. All the benefits of platinum also contribute to its one negative which is the high cost of this metal. Because platinum possesses many desirable characteristics from a jewelry standpoint and is especially rare- found in only certain regions of the world- it is substantially more expensive than gold, making it impractical from an economic standpoint for some jewelry creations. At Lauren B Jewelry of New York, platinum is regularly used in engagement ring settings and diamond wedding and eternity bands. We offer our clients the option to choose which precious metal they desire for their custom, hand-made, engagement ring settings. our extensive fine fashion jewelry collection only has a handful of products that are set in platinum. As a general rule of thumb, platinum is far more common in engagement and bridal jewelry, than with any other type of jewelry. Gold is a rare metal that is commonly used in fine jewelry creations for its attractive, bright finish. Its aversion to rusting or breaking down unlike other, less durable metals, makes it popular choice amongst fine jewelry retailers. Gold is naturally soft and very malleable, meaning that it can be shaped into most any jewelry design. All these attributes contribute to the enduring, and seemingly always increasing, value of pure gold and gold jewelry. In terms of jewelry, gold is generally characterized according to its level of purity, and its color. Purity: As a measure of purity, karat (abbreviated as “K”) is used to measure how much actual gold content is in the metal of the jewelry. 24 karat gold is 100% pure gold meaning that it is 24 out of 24 parts gold. However, it is too soft to be used for most jewelry and is not practical for everyday wear. Therefore, gold is mixed with other alloys to make it more durable and secure for gemstone settings, while at the same time making it more cost effective. • 18 karat gold is 75% pure gold (18 out of 24 parts) and is mixed with other alloys such as palladium, copper, zinc, nickel and silver to make it more stable especially when it comes to settings created for holding different types of gem stones in place. At Lauren B Jewelry, a majority of our fine jewelry collection is formed out of 18 karat gold because of the richer, more golden appearance it gives off than lower karat gold. • 14 karat gold is 58.3% pure gold (14 out of 24 parts gold) and contains a higher content of other metals than 18 karat gold, making it a stronger, less malleable metal. Most of our delicate engagement ring and wedding band designs are create in 14 karat to give it more durability and to withstand daily wear and tear. Color: The other important factor to consider is the color of the gold. This decision can be a matter of personal taste on the consumer’s part; such as what color goes with your skin tone, or you may be simply looking to add variety to your jewelry collection. Current fashion trends within the jewelry industry may also dictate what color metals are most popular at the time. 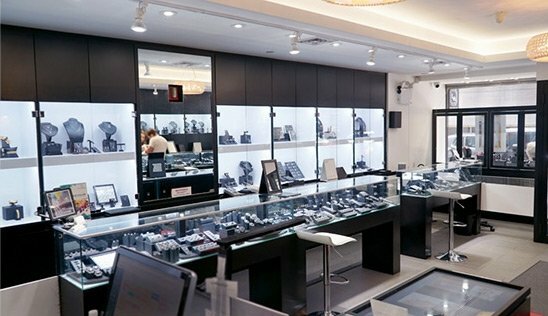 At Lauren B, we design and sell elegant pieces with certain combinations of metal colors and different gemstones, based on our many years of experience as jewelers in New York City’s Diamond District. o YELLOW GOLD: Yellow is the natural color of this metal, and is often thought of as the most classic color for fine jewelry making. 18 karat yellow gold will give off a brighter appearance while 14 karat is more subdued and is usually the choice for engagement rings. 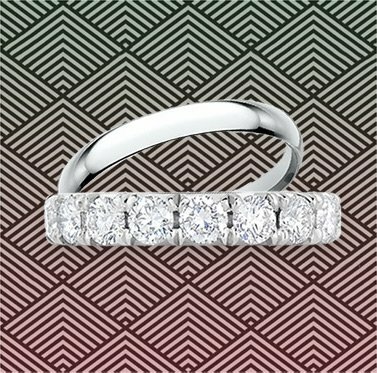 o WHITE GOLD: This metal has arguably become the most popular in the world of engagement rings and fine jewelry. To create its white appearance, gold is alloyed with lesser white metals such as silver and palladium, and then coated with another white metal called Rhodium. The Rhodium is very similar to platinum in that it is extremely white an d strong, however it needs to be maintained (“re-rhodiumed”) every so often in order for the white gold to retain its appearance. Despite this need for constant care and being lighter in weight, white gold can be a very acceptable alternative to the far more expensive platinum. o ROSE GOLD: This precious metal used for jewelry purposes is created by adding larger portions of copper (a reddish-orange metal) to the alloy mixture. Rose gold is a relatively new phenomenon in the jewelry industry, with its beginnings tracing back to just over a century ago. This metal has seen a noticeable spike in popularity of late because of its exotic yet elegant appeal to jewelry shoppers. o BLACKENED RHODIUM GOLD: This color metal is created by adding black Rhodium plating to the gold alloy. Blackened gold can create a beautiful setting for all gemstones- especially black and brown diamonds, colored semi-precious stones, and pearls. Black rhodium gold is also a popular choice in our engagement ring collection for someone after a completely unique appearance. o TWO-TONE GOLD: Different combinations of rose, white, yellow and blackened gold in the same jewelry piece creates a bold yet fashionably elegant statement when done properly. The different shades of these gold metals when used together can be very alluring. Which one is more expensive? Firstly, platinum is more expensive than white gold because it is a denser, more pure metal and is naturally more rare. Essentially, more platinum is required to make a ring which gives it that heavy weighty feel. Gold might be more expensive right now per gram however less gold is used in the making of a ring therefore the finished product is less expensive. Do they look different? Platinum and white gold look the very similar, if not exactly alike, at first glance however you can feel the difference in the weight of them side by side. Platinum and white gold will begin to appear different as they are worn. Platinum's shiny finish goes down to a more matte look over time as it goes through normal daily wear. Platinum is naturally white and will always look white. White gold will scratch but maintain a shinier look over time. However, the natural yellow elements in white gold will start to show through after some time depending on the wearer. Keep in mind white gold can always be re-plated to bring it back to its original color as well. Which is more durable? Platinum is soft and malleable meaning it is more bendable. We find that platinum works best for our intricate micro-pave designs because our craftsmen can easily achieve precise designs when shaping the metal. In addition, because the metal is suppler, it will hold in tiny pave stones more securely. The finished product of platinum rings achieves a more sleek, refined appearance. White gold is tougher and less bendable. When white gold scratches the metal is actually removed from the ring making it more prone to breakage. Summary: White gold is lighter, shinier, less expensive, but needs to be re-plated after time to maintain its white appearance. Platinum is naturally white, heavier, matte, softer, malleable, and maintains a sleek look. Yellow Gold: Yellow gold is the most traditional, considering that gold in its original state is a reddish yellow color already and has been used for centuries in both jewelry making and the economy. Yellow gold is a gorgeous option if you like a classic look that provides contrast to colorless diamonds and can even be used to enhance paler gemstones (most commonly those with green or yellow hues). Rose Gold: Rose gold has been around for a long time, but it has more recently become all the rage. Between the two, rose gold is more popular for recent bridal jewelry and offers a more subdued appearance that goes well with delicate pave settings. Rose gold settings can add a splash of color to any ring, making it more unique to your personal style. A rose gold setting can also enhance the appearance of more translucent gemstones, such as Morganite and paler pink sapphires. All gold, even yellow, is mixed with different alloys to make it very certain colors, as well as more durable. For the sake of comparison, I will use 18 karat gold as the example. 18k gold of any color is 75 percent gold and 25 percent alloy. 18k yellow gold is most commonly a mixture of 75% gold, 16% fine silver, and 9% copper. 18k rose gold is the same 75/25 mixture, but is 21% copper and 4% silver to make it more reddish-pink. When it comes to engagement ring and wedding band designs, rose gold is the slight favorite. It does a better job of blending in with most skin tones and has a subtler hue to it. Both of these color metals will bleed into the color of your center-stone which is why we suggest a two-tone setting, with a color metal band and white gold top, to most clients.